Reflecting the broad-ranging interests, refined taste, and voraciously curious mind of Pierre Bergé, the 1,000 lots to be offered at Sotheby’s Paris span everything from antiquity to modern art. Previously housed in Bergé’s beautiful, and very distinct homes in Paris (Rue Bonaparte), Provence (‘Mas Theo’), Morocco (‘Villa Mabrouka’) and Normandy (‘the Datcha’), all decorated by renowned interior designers Jacques Grange, Graff and Peregalli-Rimini, the lots will be exhibited and sold in Paris over the course of three days this autumn (29 – 31 October 2018). Interior of Pierre Bergé's apartment in rue Bonaparte, Paris. An aesthete and astute businessman, who co-founded the fashion label Yves Saint Laurent, Pierre Bergé (1930-2017) was also a renowned philanthropist, lover of literature and one of the most important collectors of his time. A man of the arts, he amassed, over more than fifty years, an eclectic collection of 16th and 17th-century vanitas, Orientalist paintings and antique furniture in addition to Islamic, African and Asian art. "One can say without exaggeration that Pierre was passionate, to the point of obsession, with design in all of its forms and manifestations. Apart from the houses he shared with Yves Saint Laurent, which are all well documented, his personal retreats—on the Rue Bonaparte in Paris, in Saint Rémy de Provence; the Villa Leon l’African and later the Villa Mabrouka, both in Tangier, Morocco, and even his former apartment in New York—were distinctive and idiosyncratic expressions of his myriad passions and fervour. Each place had a particular character and setting, with its own set of contextual tenets that were strictly adhered to, and which subsequently defined how those houses were lived in […]. D’une demeure l’autre contain the multitude of private pieces that composed these singular atmospheres that Pierre simply called home, the elements that comprised the complete tableau surrounding this dynamic and intense man. Yves Saint Laurent was often quoted as saying that in the future, in the matter of taste, we will speak of le goût Bergé, as one refers to le goût Noailles or le goût Rothschild, and no doubt that day has come." In 2002, Pierre Bergé opened Pierre Bergé & Associés, his own auction house in Paris. The ‘Pierre Bergé: From One Home to Another‘ sale, organised by Sotheby’s in association with Pierre Bergé & Associés, features a selection of masks from Africa, Oceania and the Americas—Baule and Yaure masks, in their great classicism, complement the less-common aesthetics of a New Britain Tolai mask, which once belonged to Loed and Mila van Bussel, and two Alaskan Inuit masks. 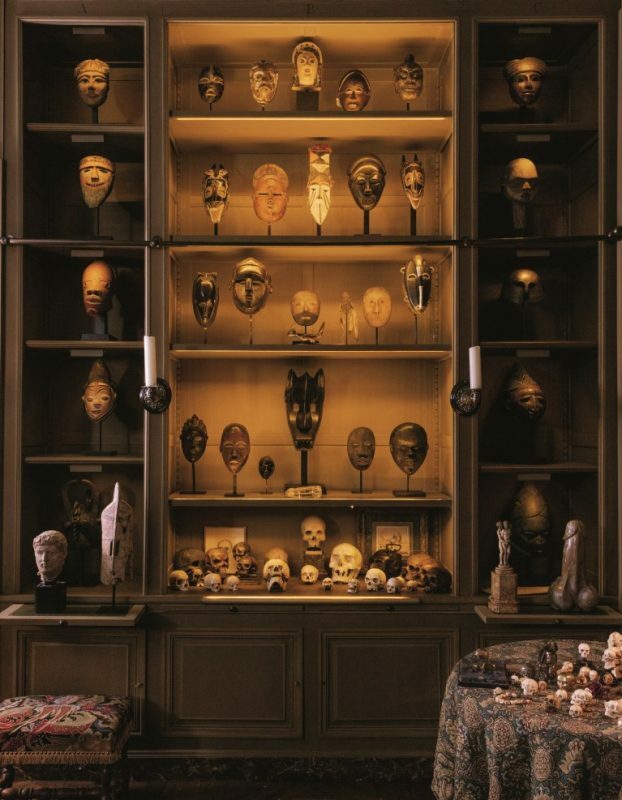 While the majority of the works are personal acquisitions of Pierre Bergé, two masks are directly taken from the historic collection of the Saint Laurent / Bergé partnership, and can be seen in pictures of their mythical rue de Babylone apartment—the ivory Lega mask (lot 225), presented during the Jacques Doucet – Yves Saint Laurent. 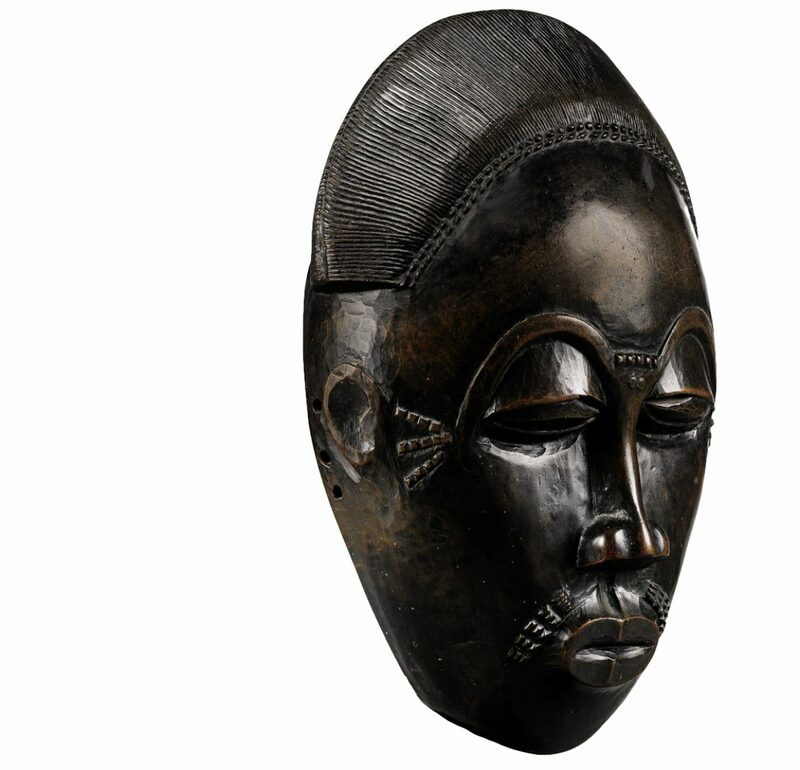 Vivre pour l’Art 2015 exhibition, and the Cameroon Bekom mask (lot 213). The very appealing estimates, common to all the works in the sale, are the fruit of a determination towards transmitting. Proceeds from the sale will benefit foundations close to Bergé’s heart—Fondation Pierre Bergé – Yves Saint Laurent and Fondation Jardin Majorelle. 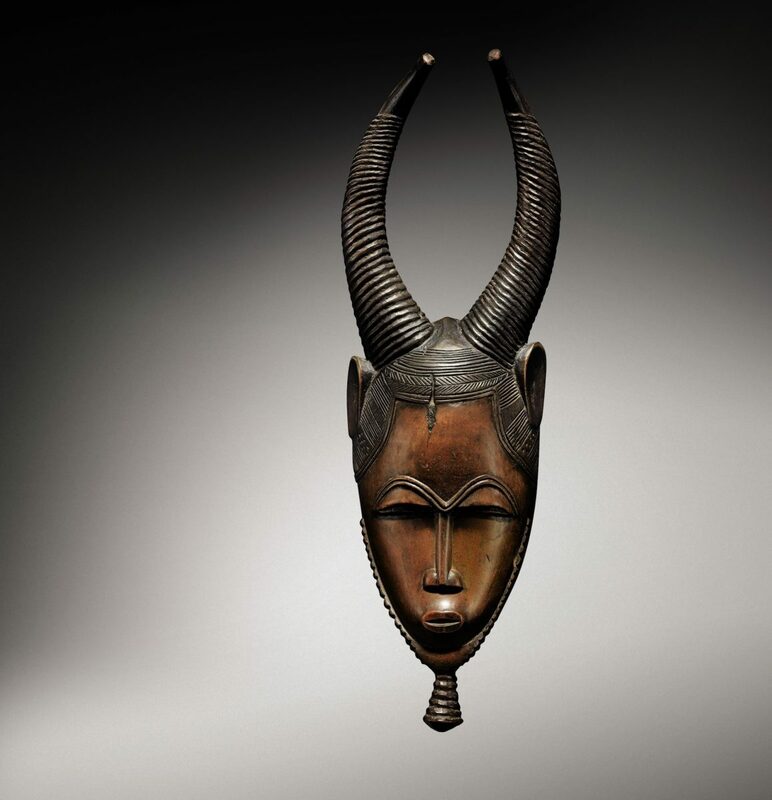 Among the more than fifty works of African, Oceanic and American art, two masks are of particular interest. In its expression, ornamentation and the accuracy of its lines, this mask is the remarkable testimony of a corpus considered to be one of the oldest forms of Baule art. Sculpted in honour of a person whose name it bears (an important political character, dancer or beautiful young lady), the portrait-mask celebrates an ideal image “responding less to an attempt at individuation than to a transfiguring effort“. 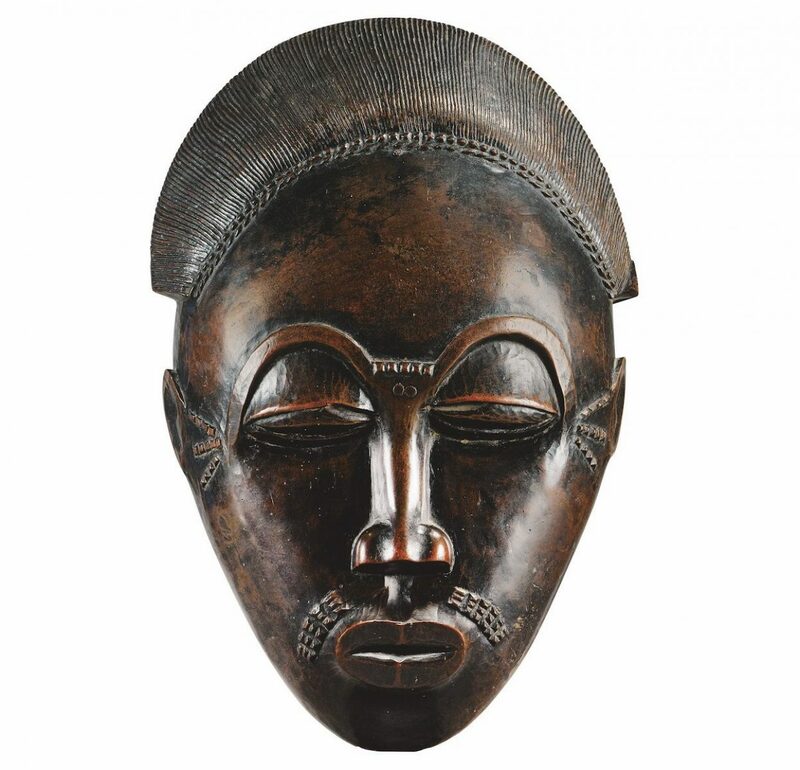 Considered by the artists themselves as “the height of Baule sculpture“, this mask embodies fundamental Baule style. 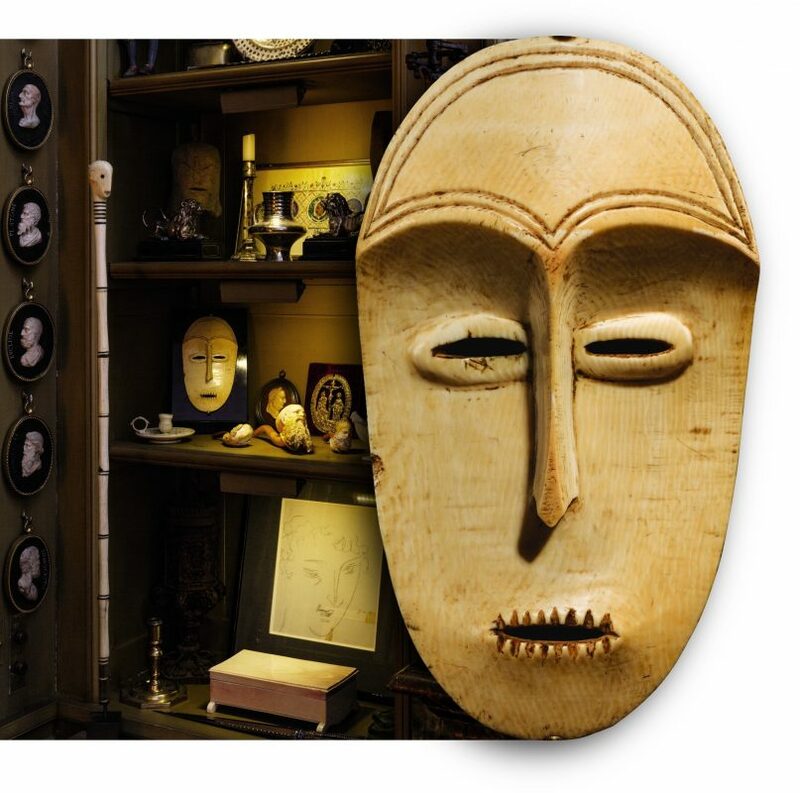 The gyè masks, which blend the human face with attributes from the animal realm, are the most famous of all Yaure masks. Here, in a superbly mastered sculptural gesture, the artist lengthens a delicate face with two elegant horns. The perfect balance of lines within the mask is accentuated by the contrast between the minimalism of the features and the richness of the sculpted attributes. The refinement of its execution represents the pinnacle of this aesthetic, an aesthetic which influenced the art of the neighbouring Baule. 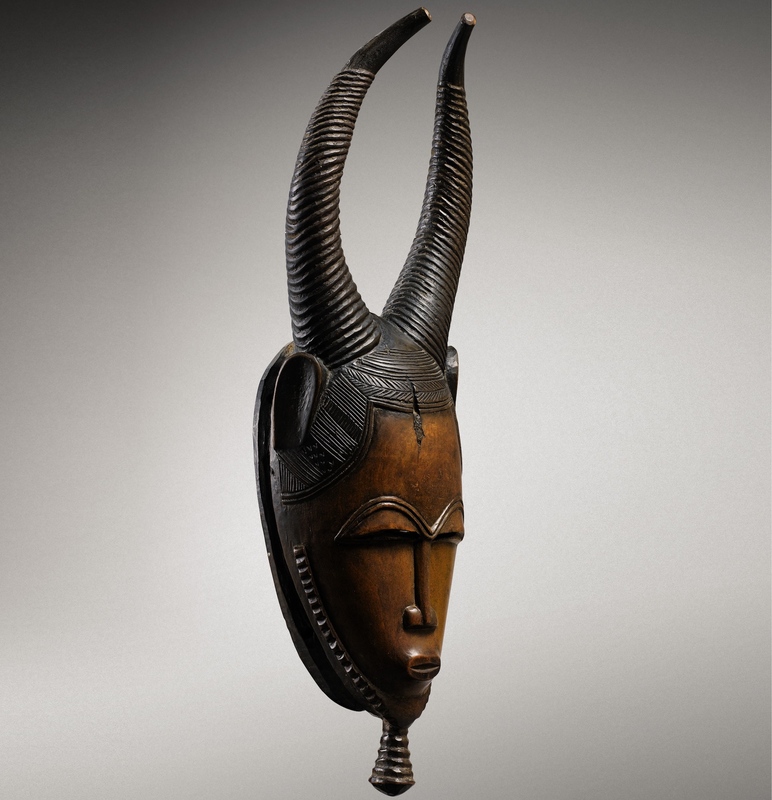 After graduating from l’Ecole du Louvre with a speciality in Oceanic Art, Pierre Mollfulleda joined Sotheby’s Paris in March 2016 as a cataloguer and specialist in African and Oceanic arts.